Does this mean it's now "Rock, Paper, Cell Phone"? 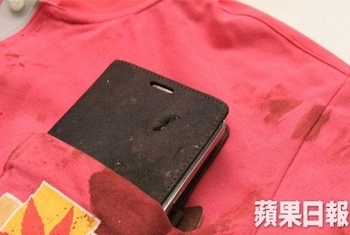 In a strange turn of events, a Taiwanese man is alive today thanks to his phone- a Samsung Galaxy Mega- which happened to protect against an incoming bullet. Details about the incident have been conflicting across multiple reports, but there are common threads in the story. Han, the owner of the Galaxy, happened to be outside when he found a wallet lying on the ground. Picking it up, he joked that the owner would "treat everyone to beers". A short time later the original owner of the wallet, named Xu, returned to the spot. Words were exchanged, Han pulled out a knife (some say it was a sickle), and Xu responded by pulling out a pistol. Xu shot Han, and proceeded to flee the scene. The bullet traveled cleanly through Han's arm, stopping only when it came into contact with his Galaxy Mega in his shirt pocket. The perfectly placed phone protected against the bullet entering his chest and causing even further injury. Since the attack avoided damaging any bones, Han is expected to make a full recovery. Xu ended up giving himself up to the police, and told police that he had attempted to kill Han. Interestingly enough, this incident is not the first one in which a cell phone has protected its owner against firearms. Back in May, a Nokia Lumia 520 protected a Brazilian police officer that was shot at by home invaders- and a Florida gas station cashier was saved by his HTC Evo 3D last October when a thief shot him as they left the store. I was actually wondering if a cellphone could deflect a bullet earlier today. Well, not exactly, the display on the Galaxy was probably Gorilla Glass, I was wondering if it would be feasible to use it as bullet proof inserts in flak jackets instead of ceramic. Surprising. Samsung build quality is abysmal. Thin, cheap plastic and an LCD screen won't save you, most of the time. HTC One is probably the only phone that reliably could take a shot. Words were exchanged, Han pulled out a knife (some say it was a sickle), and Xu proceeded to pull out a pistol. Xu shot Han, and proceeded to flee the scene. if you ask me, Han shot first. I thought about Han Solo when I read the article too. On Topic: I'm glad he's expected to make a full recovery and that no lives were lost. Holy crap, The Boondocks was right. Fun things to ask next time you're at a cell phone store. "Mmm-hmm. 4G, wi-fi, bluetooth, battery life... tell me, which of these does the best job at stopping bullets? I have a lot of enemies, I'm just sayin'." Taken out of context... he never got that far, even in the darkest corners of the Extended Universe. I'm unsurprised... not that I know much about any particular model of smartphone beyond "it runs one of those bastardized mobile OSes with no native support for closing applications... on an ARM processor"... but aren't some of their shells made of kevlar now? I know I've seen commercials to that effect... and I know firsthand how well a few layers of the stuff stops a handgun bullet. Well if someone ever shoots me in the right thigh i know ill be safe because of my Samsung. But on the other hand i also think its a whole list of things that had happened in those situations that made the prevention possible. I would not rely on it too much. If you start shooting phones its the stoppage rate is probably going to end up being like 1 out of 10 or something. And why was the guy taking out a knife anyway.....like the whole story was so weird. Would make for a great slogan. "Galaxy. ItÂ´ll save your life." It would be one of those comercial woman voices and there would a bling blingy *ding*! at the end. YouÂ´d have a series of commercials displaying how the phone "saves" you. In social situations, work, facebook n tings and also stopping bullets. When the bullet traveled through Han's arm, didn't it lose quite a bit of velocity already? I'm pretty sure that's exactly what happened. After going through the arm the bullet could have stopped on a pocket watch or a notebook (for clarify: one of those 'old fashion' paper ones). Well, depends what bullet from what gun, which the article didn't specify. Going off on a limb here, but I'm guessing more likely to be a .22 than a .223. They mention it was a modified gun - I'm guessing it might have been a 3d printed one (I don't suppose he was using magnum rounds ;) or one with a shortened barrel - decreased velocity=decreased penetration. Just stabbing in the dark here (pun intended). The bullet probably didn't hit the phone at a 90 degree angle - the smaller the angle the easier it would have been to deflect or stop it. Wow. He fell for the wallet scam. The wallet scam? Care to elaborate? Just wait... you know Apple is going to sue Samsung for this. Would make a great mythbuster episode, test out the bullet stopping power of different cellphones. My money is on the iphone, since it's made of metal instead of plastic. Damn you got there before me, quick sir! Seems like a tablet would offer more protection. I'm just waiting for this to happen with an Iphone, except instead of stopping the bullet like the other phones, the Iphone merely disintegrates and introduces thousands of glass shards into the body as well. I wouldn't want anyone shooting at me with 7.62mm wearing nothing but smartphone screens in my vest. When it comes to stopping a bullet, you don't really look at material tensile strength. In fact, plastic is made up of strings of intertwined molecules (hence the name polymers), which are usually more effective at dissipating kinetic energy than a thin piece of metal which is more brittle. It's when you use a wallet full of things as bait for people to conveniently scapegoat unwary victims on. Is that the best name for someone ever? On topic, I'm wondering what the gun was. It couldn't have been something large caliber, since I'm assuming that this would have been at reasonably close range, considering one of the two had a knife. Okay, no offence, but you worded this really strangely. Do you mean that they leave an empty wallet somewhere on the street, wait for someone to pick it up then leap out and insist the finder stole money from the wallet and try to extort them that way? I need to watch more Boondocks. ...and then the battery runs out. Now if only it were a Nokia and this would have been both beautiful, and hilarious.